Tropinin is an excellent portrait painter of the 19th century. A whole series of paintings devoted to children’s portraits. The artist loved children very much. In children, he saw the pure soul and dreamy people. Vasily Andreyevich wrote a portrait series belonging to the image of children with various attributes that symbolize a sensitive childish soul. The portrait painter skillfully conveyed in his works an innocent and touching worldview, emotions, because he knew how to understand a child’s soul. 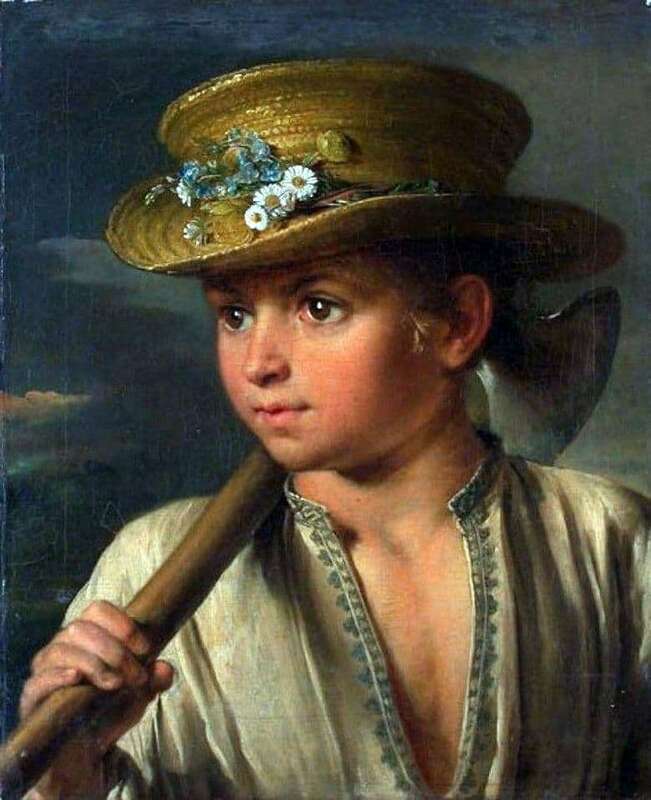 The painting “Peasant Boy with a Hatchet” was painted in 1810 and refers to costume portraits. A child’s image does not belong to any particular person, but is an idealized, generalized image. It is assumed that the prototype of the portrait was one of theatrical roles. In the portrait there is an image of a peasant boy, about 9 years old, who has a not childishly manly look, but at the same time is pure and innocent. The boy is dressed in a peasant shirt, on his shoulder he holds an ax, and on his head he wears a yellow straw hat decorated with daisies and forget-me-nots. From under the hat punch golden hair. The boy’s face is turned to the side, his gaze is directed away. Soft lighting emphasizes the features of a young face, which plays a fresh blush. In the corners of the mouth of the child a slight smile is noticeable. The picture has a connection with the system of sentimentalism inherent in that time. Many portraits of this genre were written in the same spirit. At the same time, the portrait of a peasant boy holding a hatchet is close to the “heads” of Rotary by the character of his image. The portrait is painted in oil. The artist uses to paint a portrait rocaille range of additional colors, but still with a predominance of a golden hue. Smears are smooth and soft, have a transparent and flickering texture.